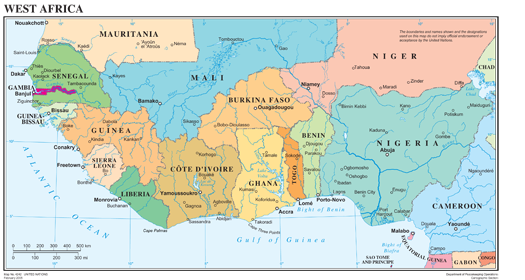 For decades prior to the signing of a Comprehensive Peace Agreement (CPA) in 2003, Liberia suffered through authoritarian rule and one of Africa’s most brutal civil wars, which killed more than 200,000 people and displaced over a million more. The third India Africa Forum Summit (IAFS) in New Delhi this week, with over 40 African heads of governments and states attending, will be the biggest foreign policy event hosted by India in more than three decades. While this process was partly in response to initiatives by other emerging powers, particularly the Forum on China-Africa Cooperation launched in 2000, it was also a belated recognition that Africa was becoming an indispensable continent for India’s future—one that New Delhi can ignore at its own detriment. 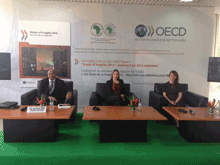 On April 8, 2015 in Abidjan, Côte d'Ivoire the African Develpment Bank and the Organisation for Economic Co-operation and Development (OECD) launched the 2015 OECD report on fragility. This report researched and authored by CIC's Sarah Hearn, David Steven, and Ben Oppenheim, contributes to the broader debate to define and implement post-2015 Sustainable Development Goals (SDGs). It points out that addressing fragility in the new framework will be crucial if strides in reducing poverty are to be made. Peacebuilding continues to gain recognition in international and national spheres for the crucial role it plays in laying the foundations for sustainable peace. In the last two decades, the United Nations has developed its peacebuilding architecture (PBA) in order to strengthen its responses to countries recovering from conflict. Within this larger context, 2015 will be a critical year for peacebuilding as member states undertake a comprehensive review of the UN PBA. In November, CIC joined with the Institute of Security Studies to host a discussion with member state representatives and UN staff on African perspectives on the future of peacebuilding. Peacebuilding continues to gain recognition in international and national spheres for the crucial role it plays in laying the foundations for sustainable peace. In the last two decades, the United Nations has developed its peacebuilding architecture (PBA) in order to strengthen its responses to countries recovering from conflict. One hundred and seventy soldiers, 50 degree heat, 10 months away from home and 700 individual missions to complete. This all adds up to one of the toughest deployments in recent Chinese military history, undertaken by the first batch of People's Liberation Army (PLA) soldiers sent on a UN peacekeeping operation in the war-torn West African country of Mali.